Mod The Sims is one of the largest Sims 2 & Sims 3 sites, and provides premier downloads, custom content creation tutorials, general game help and social discussions on many aspects of the games. We have a friendly atmosphere and pride ourselves on the quality of creations, while being entirely free to use. New to the site or just visiting? We have a great selection of downloadable content, but only members can download, so register now! If you are lost or don't know where to go, try out Site Map for Sims 2 or Sims 3. To navigate around the site, use the menus located in the blue bar at the top of the page - News, Help, Create, Downloads, Community, Site and Search. To see more site news items, click here. Our April creator is the fantastic and incredibly talented modder, IceMunMun. When she's not hard at work as a doctor, she's busy making delicious food and innovative mods for our sims! 1. When did you start playing The Sims Series and what attracted you to it? 2. What is your favourite installment of the Sims series? My favourite installment is still the Sims 3 (even though I do not play it as often I want to). 3. If you could only have one expansion/stuff pack from any of the series and it would work with your preferred instalment (1,2,3 etc), what would it be? 4. When did you start creating for the game and what made you decide to become a creator? I started creating in 2012-13 but only started sharing in 2014. I had always wanted to make food and harvestables for my sims and since there was a scarcity of those for sims 3, I decided to get my hands dirty and jump right in! 5. What is your favourite thing about being a creator? My favourite thing is the opportunity to brainstorm different ideas and be able to see it to fruition! 6. What was your first creation? Photos welcome! 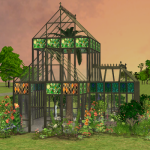 I think my first non-lot upload was a Cardamom harvestable for Sims 3. Oh the absolute happiness I felt, when I could actually get to work and fit for upload! 7. What creation are you most proud of? Community News - MTS March starter speedbuild challenge! First off, fabulous work with the Crumplebottom Challenge! It's been great to see everybody's creativity..very creative ideas. But now, get those games loaded, get those snacks bought and get ready, because here comes the March installment of the speed build challenge! This time we're starting out a bit differently...this time, we challenge you to build a starter lot! So choose your favourite game, and get building! This is a timed event- so you will have 2 hours in which to complete the challenge. Join in on our live chat Discord! At the start of each session, all of us log in and begin to build! Make sure you post pictures of your lot so far every 30 minutes, whether you are joining us on the day, or building along so we can all see how you're progressing, and then when it's all over, you get to show off your finished lot in chat! When will this happen? Where will this happen? The MTS Discord Server is where all the fun will happen, in a special text channel created just for the event. Our March Creator is the incredibly talented builder, Zarathustra, who has been providing the TS2 community with outstanding buildings for many years! From hospitals to houses, to churches and cabins in the woods, you can bet that it has been tackled! Tech News - The User experience survey Part 2 - The discussion forums and the hompage! Hello! Yes, I have returneth! Because of the success of the other survey, which was about the download browse page and the download page, we also wanted to give the folks who love to check out the discussion forum a chance to give their feedback! This one does include a few misc questions for creators that we'd love to know about as well as community-related questions, although those aren't requirements to answer. The survey is completely anonymous, so please behave, else we'll have to tell mom! Ms. Crumplebottom is starting to feel her age; Her notoriously sharp eyesight just isnâ€™t what it used to be and just last year, she pulled something in her shoulder while employing a particularly lethal handbag blow upon an unsuspecting young manâ€™s head as he got handsy with his date at the Love Day Parade. She tried everything, from removing her favourite brick from her handbag, to pointedly tutting with disgust instead of resorting to violence, but nothing worked. Ms. Crumplebottom has come to the conclusion that she will have to move out of her lace-curtained townhouse and far, far away from the loose lips and loose morals of civilisation. Itâ€™s the only way. Build a house for an uptight, curmudgeonly elder (it doesn't have to be Ms. Crumplebottom, but she certainly does make things interesting!). Think floral print, potpourri , mothballs and cookie tins that only contain sewing equipment and despair. Lot Size - 30x30 lot at the largest(appears as 3x3 etc in some versions) or any of the smaller sizes. The smaller and more hidden away, the better! 1. No electrical items other than lighting, kitchen appliances and perhaps a phone. 2. Decorate in a fussy, dated fashion. Clean, modern lines are not appreciated. Furnish a room of the house for your simâ€™s old, cantankerous feline friend. These are for our seasoned builders and those who love a challenge, but they're by no means necessary. Remember to tell us if you followed one of these! 1. Limited Funds: Ms. Crumplebottom was sued by Dina Caliente after a particularly embarrassing encounter when she was out on the town with one of her conquests. After paying up, she only has Â§30k left to build her home. Fantastic likeness with stunning landscaping, this manor is a phenomenal build! Ms. Finster is a strict disciplinarian feared by many, seen as a challenge by others and adored by Randall. Reduces the keystrokes and eliminates the need to find sim IDs, and simplifies vampire cheats! An awesome tool that makes it easy to create unique pets and customize them in CAS! Does your sim dream of being a dancer? This beautifully written, detailed career path could be perfect for them. Tywin Lannister, as a sim as portrayed by the actor, Charles Dance, in the TV series 'Game of Thrones'. Looking for tutorials on how to make custom content? See our modding tutorial sections. Got a problem with your game? Our Game Help section can help you! Site version: v2.9.3. ModTheSims, ModTheSims2 and MTS2 © 2004-2013.